The SSC CHSL Question Papers are available here in pdf format. The aspirants can download SSC CHSL Postal Assistant previous question papers for the postal assistant for free. You can also obtain SSC CHSL exam details like exam pattern, syllabus, and selection procedure on this page. The aspirants can download the SSC LDC sample papers from the provided direct links in the last section. The aspirants who are searching for the SSC Postal Assistant old papers can download them on this page. As it has a vast number of vacancies, many people are applying for the SSC CHSL exam. The competition will be very high, so the candidates need to prepare well for the exam. The candidates who are applying for the SSC CHSL exam must start their preparation immediately. The Staff Selection Commission has released a notification regarding the recruitment of SSC CHSL exam. The number of vacancies is 3359. The posts to be filled for the SSC CHSL exam are Lower Division Clerk, Postal Assistant/ Sorting Assistant, and DEO. The interested can apply for the SSC CHSL exam with a qualification of Intermediate. The candidates are advised to apply for the SSC CHSL exam before the last date. More details about the exam pattern and syllabus are given in the below sections. The selection process of SSC consists of three rounds. The Tier-I is the written exam which is the online exam. The Tier-II is the Descriptive test. The Tier-III will be Skill Test or Typing Test. The questions from the Tier-I will be the objective type questions. The Tier-I and Tier-II exam Pattern and Syllabus are described in the following sections. The Questions in Tier-I will be set in both Hindi and English. There will be negative marking of 0.50 for each wrong answer. The CHSL Tier-III exam is Skill Test or Typing Test. In 15 minutes, 2000 key depressions must be typed. Follow the selection process provided here. The Staff Selection Commission Board is conducting the CHSL exam in three stages. The candidates who will qualify all the three rounds will be shortlisted for the LDC, DEO and Postal Assistant Jobs. Check the syllabus to get awareness of the SSC CHSL exam. Get prepared with all the subjects to qualify for the written test. The Applicants who are appearing for the SSC CHSL exam can refer the SSC CHSL LDC, Postal assistant, DEO Previous papers for obtaining a good score in the SSC CHSL written exam. The candidates will also get the study material, preparation tips along with the SSC CHSL Question Papers. These SSC Postal Assistant solved question papers will be very useful for the candidates for practicing purpose. The contenders will be able to know the different methods of solving the questions. We hope that the above-provided pdf attachments will be helpful for the aspirants in their preparation. 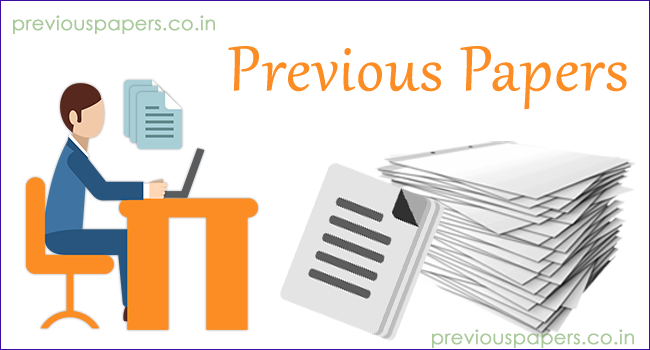 Follow our website www.previouspapers.co.in for more model papers of state and central government jobs.